Considering I’ve lived in or near Toronto almost my entire life, and have been a hockey fan for that entire time as well, it’s somewhat surprising that I have only been to the Hockey Hall of Fame twice. The first time was in the summer of 1991, and I have a short story about that visit. The second time was this past weekend, and I have a few things to say about that as well. Back in 1991, I visited the Hockey Hall of Fame when it was still located at the old Exhibition grounds. My friend Beth and I were at the CNE and decided to check out the Hall while we were there. 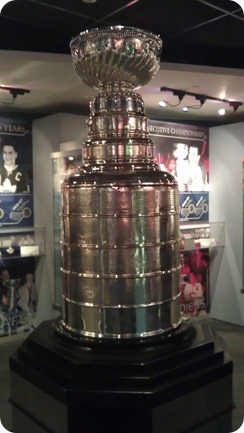 When we got into the trophy room, the Stanley Cup was sitting in the middle of the room on a table similar to this one. There was no security anywhere to be seen; the closest thing was another table nearby where there were two teenaged girls siting. They had a Polaroid camera and would take your picture with the Cup for $10. I assume they worked for the Hall, but maybe they were just resourceful. Beth and I walked around the Cup looking at the inscriptions, when one of the other visitors said aloud “I wonder how heavy it is”. He put his arms around the Cup and lifted it. Beth and I took a step back to let the security guys through, and put our hands over our ears to protect ourselves from the wail of the sirens, except… nothing. No security guards, no alarms, nothing. The girls with the Polaroid didn’t even look around. The guy who lifted it said something like “Huh! Not that heavy” and put it down again. Of course, I took the opportunity to do the same thing, something every Canadian kid dreams of doing: I hoisted the Stanley Cup. It’s not that heavy. When we were there last weekend, I did not attempt to lift it, as there was a security guard there. I asked the security guard how many replicas there were, and if this was one of them or if this was the real Cup. He gave me an interesting answer: there are two Cups and neither one is a replica. There’s the “presentation Cup”, which is the one the winning players raise on the ice, and the one they take back to their home town. And then there’s the one in the Hall (he had a name for it other than “replica” but I don’t remember it), which is an almost-exact, well, replica of the presentation Cup, though there are a few names spelled differently on each one. To me, this sounds like there’s “The Cup” and “the replica”, but the guy at the Hall said that both are officially “The Stanley Cup”. There were stats and facts and a signature and jerseys and a stick and even a box of Corn Flakes with Mario on the front. 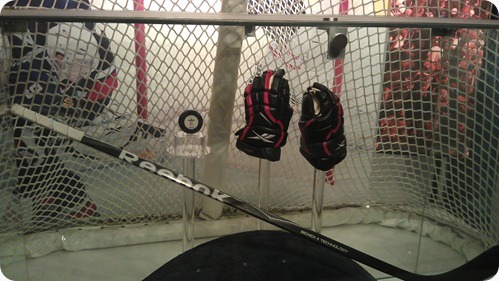 There were similar displays for Wayne Gretzky, Bobby Orr, Denis Potvin, Luc Robitaille, Roger Neilson, Ace Bailey (which included one of his golf clubs (? )), Borje Salming, and a bunch of others. There was a computer listing just about every town in Canada; you could select a town and find out what NHL players were born there. Guess who’s from Waterdown? Well, nobody. But I grew up in Pickering, Ontario, home of both Glenn Healy and… um, nobody else. OK, I guess I can admit it. I am from the same town as everyone’s favourite hockey douchebag, Sean Avery. We even went to the same high school, though he would have started at least five years after I graduated. There is also a large section of the Hall for international hockey, including the Canada Cup, the Summit Series, various IIHF tournaments, and the Olympics. There are jerseys from just about every country – did you know Ireland had a team? Greece? Mexico? South Africa? Canada won four hockey gold medals in a row at the Olympics from 1920 to 1932, but would you believe their streak was broken by none other than Great Britain in 1936 – the most recent of only two hockey medals Britain has ever won? One thing that surprised me about my visit to the Hall is the number of mistakes I found. Canada didn’t win any hockey gold medals from 1952 until 2002? That can’t be right. Seriously though, thinking back to all the places I’ve visited including castles in the UK, various chateaux in France, museums and other touristy things in London, Edinburgh, Paris, New York City, Boston, Chicago, Las Vegas, San Francisco, Vancouver, Toronto, and others, the number of mistakes I found was zero just about everywhere. I’m sure I’ve seen errors but I can’t think of any offhand, and I’m sure I’d have remembered if there were more than one in the same place. 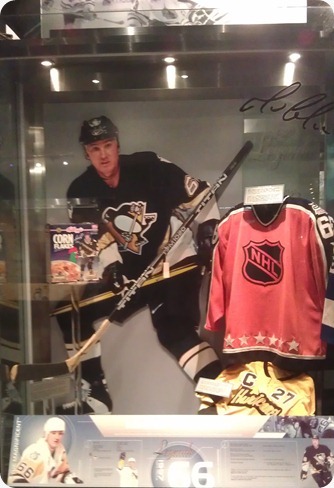 At the HHOF, I found at least four in the couple of hours I was there. 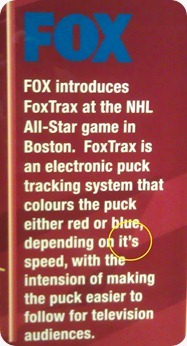 The first mistake is not so much a factual error as one of punctuation (“it’s” should be “its”). The second mistake was FoxTrax itself. There was a display of the “lucky loonie” from the Salt Lake City Olympics, although in the middle of the description they spelled the word “looine”. I’m sure my dad pointed another one out to me but I forget what it was. On a somewhat related note, there are also the misspellings on the Stanley Cup itself – a number of players have their names spelled wrong, and there’s even one team spelled wrong (Leafs is spelled “Leaes” in one place). Former Oilers owner Peter Pocklington famously put his father in the list of people to have their names engraved on the Cup, and when this was discovered his father’s name was X’ed out. Anyway, as I said the HHOF is a must-see for any hockey fan. There are the trophies and memorabilia and lots of information and stats, a couple of short movies, and some simulation games for the kids – two where you are taking shots on a net, one where you are standing in a net where real pucks are flying at you (similar to the commercial below), and one where you’re standing in front of a virtual net trying to react to virtual pucks. There’s even a section on collectibles and NHL branded products – hockey cards, toys, lunchboxes, bobbleheads, cereal boxes, stuff like that. My dad and I spent two or three hours in the Hall. QA issues aside, it’s quite the interesting place, and when combined with dinner at the Marché upstairs and a Rock game after that, made for a fun day. This entry was posted in Hockey, Sports on January 14, 2012 by Graeme.